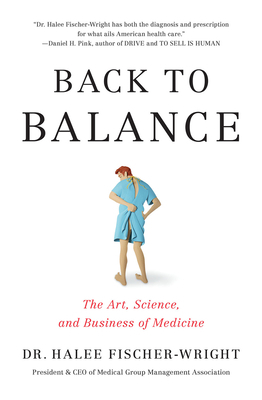 In Back to Balance, Dr. Halee pulls back the curtain on the day-to-day challenges and triumphs in health care to reveal that it doesn't have to be this way. From six medical codes for attempted suicide-by-jellyfish to absurd insurance claim processes to technology that hinders as often as it helps—it's time to correct the imbalance with common sense and collaboration. It's time to pay attention to the wisdom of the people on the frontlines. And it's time we learn how to ask more of the right questions and prioritize time, simplicity, outcomes, and relationships. Whether you're a provider, a patient, or a practice leader, this is the rare book that will change how you think about health care—and what we can all do to make it better. Dr. Halee Fischer-Wright is a nationally recognized healthcare executive and physician leader and currently serves as President and CEO of the Medical Group Management Association, the leading association for medical practice administrators and healthcare executives. She has served as Chief Medical Officer, St. Anthony North Health Campus (Westminster, Colo.), started her own successful medical practice early in her career, has spent time as a management consultant, and served as president of Rose Medical Group in Denver, a 680 physician PHO/MSO, for twelve years. She is the co-author of the New York Times bestselling book Tribal Leadership and is a nationally recognized speaker.